After a long time of thinking about this and praying about this we have a new member of our family. Her name is Liliane. Liliane is six which is just about the age of Bonnie. Lilian is in primary school and loves to sing. She loves to play ball even though her health is not so good right now. When Stacy saw Liliane we had to have her. Liliane is from Rwanda. Liliane is in great need. She has had a difficult life and needs someone to care for her. Rwanda is a desperate part of the world. Jesus instructed us to take care of widows and orphans. We fell strongly that God has told us to do this. So for those that are struggling with us doing this, let me at least somewhat give you some consolation to our news. 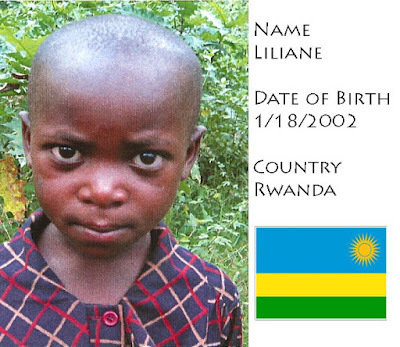 We are only sponsoring Liliane through World Vision by sending $35 a month. We may never get to see Liliane on this side of Heaven - though I hope that we do. But even if we had adopted this child I can't seem to come up with any need to justify myself other than the reasons above. We'll get to pay a huge part of Liliane's life by sending money World Vision to provide food, clothing, school, and the much needed HIV/AIDS drugs.